I suspect the number one choice for many enthusiasts. Like Montbrun, he possessed the ability to read battlefield situations and adapt instantly to tactical changes. Although Montbrun enjoyed the unflinching support of his men, LaSalle was absolutely adored by those under his command. They would have followed him anywhere. 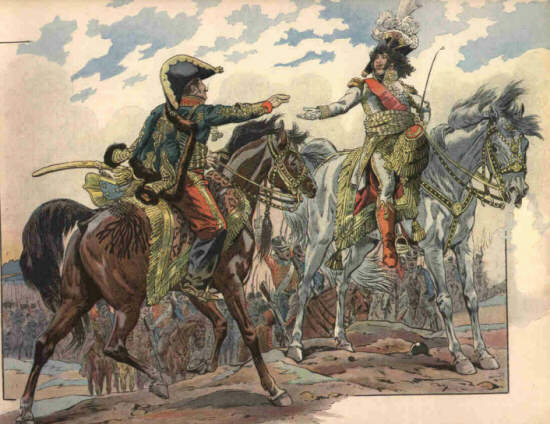 As with Montbrun, he led from the front and was a brilliant commander of large formations of cavalry. Usually to be found in the thick of the action he was present at Vicence, Rivoli, the crossing of the Piave, and the Tagliamento, the battle of the Pyramids, Salahieh, Redemieh, Samanhout, Thebes, Djehemali, Vinnadella, Austerlitz, Schliez, Zehdenick, Prentzlow, Stettin, Lubeck, Golymin, Ziegelhoff, Heilsberg, Torquemada, the bridge of Cabezon, Medina del Rio Seco, Burgos, Villa Veijo, Medellin, Essling, Raab, and finally Wagram. He was twice captured, suffered a number of wounds, saved Davout's life at Redemieh, and received "un sabre et des pistolets d'honneur" on his return to France. In December 1805 he became General-de-Brigade of the 5e and 7e Hussards which together became known as the "Brigade Infernale", with Colonels Francois-Xavier Schwarz and Ferdinand-Daniel Marx as his regimental commanders. Following his successes at Zehdenick and then Prentzlow, and with only his brigade (some 900 sabres) present, he accepted the surrender without a shot being fired, of the fortress of Stettin, with over 5,000 prisoners and 280 artillery pieces. He was the complete cavalry commander and especially adept at reading the contours of the ground over which he was expected to charge. He had no fear of death or mutilation. 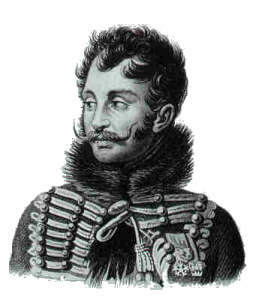 Indeed, he was famously quoted as saying that a respectable hussar should not expect to live beyond the age of 30. He was in fact 34 when he was killed at Wagram in July of 1809, shot through the forehead, he was dead before his body hit the ground. His weakness, especially in his early years was in fact his flamboyance, which time and again verged on the reckless. He worked hard and played hard and before his marriage was a notorious womaniser. Stories abound concerning the lengths he would go to, and the risks he would take to keep a liaison, even crossing behind enemy lines. One of his fellow carousers and closest friends was the infamous, almost uncontrollable, one commentator even suggested mentally unstable, General Francois Fournier-Sarlovese. The two got themselves into and out of a whole series of potentially serious and dangerous incidents. Not very tall, he looked every inch a warrior, and was by some distance the best of all the light cavalry commanders. A commander who was known, on occasion, to charge with nothing more than his pipe in his hand, mellowed a little and became more responsible after he married Josephine-Jeanne-Marguerite d'Aiguillon, the divorced wife of General Victor-Leopold Berthier, in 1803. LaSalle possessed a keen sense of duty and responsibility and cared for Berthier's three boys, Almeric-Alexandre, Oscar, and Alexandre-Joseph as if they were his own. He and Josephine-Jeanne had their own little girl, Charlotte-Josephine who was born in May 1806. The loss of LaSalle was very much regretted by the Emperor and many under his command were distraught at the news.